Customer service officers are also known as customer service representatives or specialists. They are required in almost every industry to handle the customer-business relationship, and their job tasks can vary depending on where they work. The responsibilities for this role include communicating with customers either face to face, on the phone, through emails or other channels; providing information about products and services; taking orders; responding to customer queries & complaints; processing returns; and directing calls to specialized departments in some cases. They have access to responses for the most commonly asked questions and to specific guidelines for dealing with requests or complaints. However, if a Customer Service Officer is unable to solve a specific problem, a supervisor or other experienced worker may help. Whilst addressing customer issues, customer service representatives need to analyse situations, investigate problems, and determine solutions. When a customer calls with a query or to register their complaint, a representative checks their file in the company’s computer system and use the information to resolve problems. Additionally, they also update information in the customers’ accounts such as change of address and order cancellation etc. Since the role requires interacting with customers on behalf of a company, it is essential for Customer Service Officers to be patient and polite, especially when dealing with difficult or angry customers, to be able to create and maintain positive relationships. They also need strong listening and verbal communication skills to correctly understand customers’ enquiries and concerns to give suitable response and efficiently resolve customers’ problems. Customer Service Officer may work in customer contact/call centres, insurance agencies, banks, stores, or other places that have contact with customers. This is an entry-level position that does not often require any formal education. However, they may need to undergo intensive customer service training for weeks when hired, where they learn how to operate their employer’s specific software and phone systems and develop soft skills that help them improve customer satisfaction. Candidates with outstanding interpersonal and communication skills and the ability to take direction and lead others are good fit for this position. 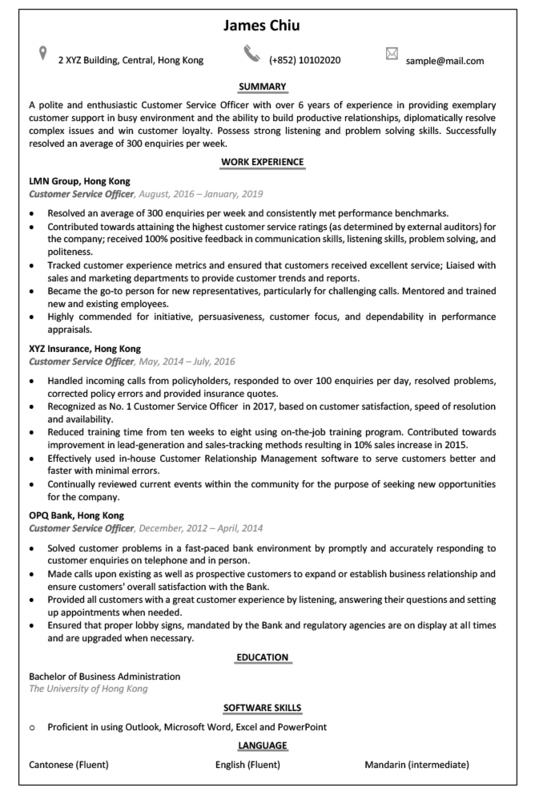 Looking for a Customer Service Officer job? Click here! Write a career summary that differentiates you from other applicants and captures the attention of the hiring manager. Give one or two quantified achievements and key skills that are relevant for the role. Include your title, years of experience and few highlights from your career that make you stand out, in 2-4 lines in the beginning of your resume. 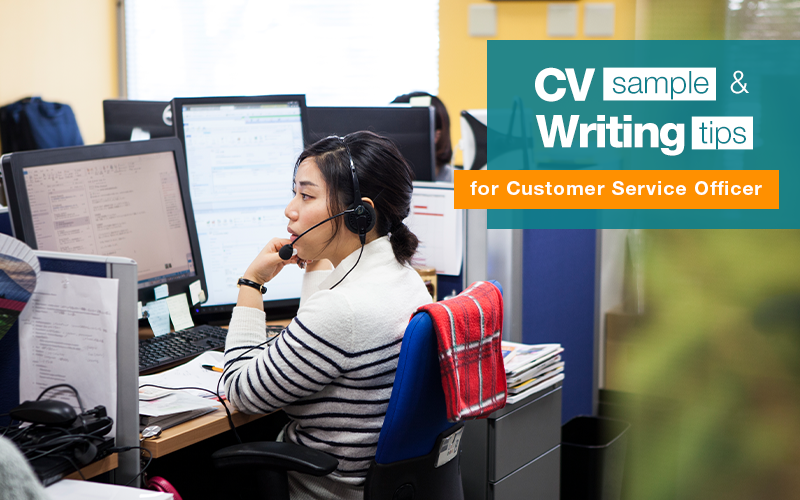 A polite and enthusiastic Customer Service Officer with over 6 years of experience in providing exemplary customer support in busy environment and the ability to build productive relationships, diplomatically resolve complex issues and win customer loyalty. Possess strong listening and problem solving skills. Successfully resolved an average of 300 enquiries per week. Include numeric details to support the facts you have stated in your resume to help the hiring manager see what skills and values you can bring to their organization. Share numbers wherever you possibly can to support your statements in scenarios where you have either met or exceeded sales targets, trained fellow employees, and reduced waiting time for customers by providing quick services and consistently maintained high level of service. For example- Achieved customer satisfaction rating of 98% within three months, exceeding company’s expectations of 90%. Mention if you have served a high number of customers while offering impeccable service and resolved a challenging service issue such as turning a dissatisfied customer into a happy customer. Emphasize on occasions when you have earned the trust of repeat customers and generated referrals as well as received positive feedback from happy customers. Highlight your accomplishments as Customer Service Officer and express that you possess the required key skills and are qualified for the position you are applying for. Give details if you have been recognised or awarded for customer satisfaction and sales achievements; completed any customer service training programs; and trained other workers to provide exemplary customer service. Resolved an average of 300 enquiries per week and consistently met performance benchmarks. Contributed towards attaining the highest customer service ratings (as determined by external auditors) for the company; received 100% positive feedback in communication skills, listening skills, problem solving, and politeness. Tracked customer experience metrics and ensured that customers received excellent service; Liaised with sales and marketing departments to provide customer trends and reports. Became the go-to person for new representatives, particularly for challenging calls. Mentored and trained new and existing employees. Highly commended for initiative, persuasiveness, customer focus, and dependability in performance appraisals. Handled incoming calls from policyholders, responded to over 100 enquiries per day, resolved problems, corrected policy errors and provided insurance quotes. Recognized as No. 1 Customer Service Officer in 2017, based on customer satisfaction, speed of resolution and availability. Reduced training time from ten weeks to eight using on-the-job training program. Contributed towards improvement in lead-generation and sales-tracking methods resulting in 10% sales increase in 2015. Effectively used in-house Customer Relationship Management software to serve customers better and faster with minimal errors. Continually reviewed current events within the community for the purpose of seeking new opportunities for the company. Solved customer problems in a fast-paced bank environment by promptly and accurately responding to customer enquiries on telephone and in person. Made calls upon existing as well as prospective customers to expand or establish business relationship and ensure customers’ overall satisfaction with the Bank. Provided all customers with a great customer experience by listening, answering their questions and setting up appointments when needed. Ensured that proper lobby signs, mandated by the Bank and regulatory agencies are on display at all times and are upgraded when necessary. Some of the key skills required for this role are clear communication and interpersonal skill, attentiveness, customer service, de-escalation and conflict management, record management, and patience. In this section, mention if you have hands-on experience or are familiar with Microsoft Office Suite (Word, Outlook, PowerPoint), Customer relationship management software (Prosper Works, Pipedrive, Salesforce etc.) or any other tools like Commercial phone systems etc. Successful customer service officers should possess at least a high school diploma or equivalent. Further formal education and few years of experience would help candidates to gain better growth opportunities. 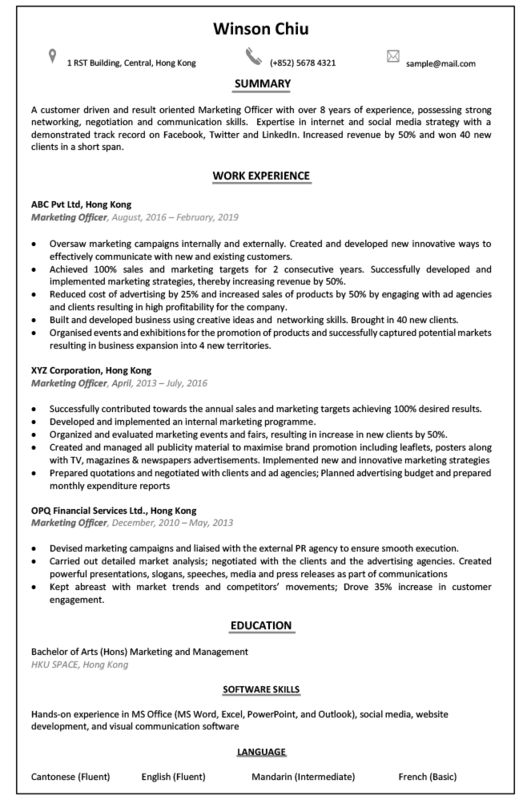 Posted in Guide to the Perfect Resume, Job Hunters by jobsDB editor on March 31, 2019 .